* Well, not everybody. After all, a hundred million moviegoers have pushed Avatar's box office over $1.5 billion. 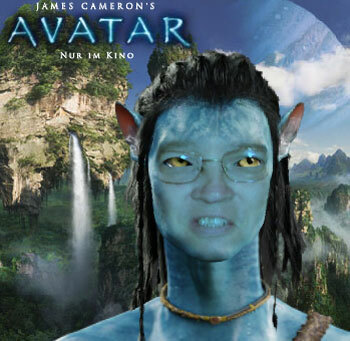 But for a movie that is putting so many people in theater seats Avatar is sure upsetting a lot of people. After the jump, who doesn't like Avatar. First, it was a local Republican candidate for Congress, David Smith, who criticized the movie (without having seen it!) for its "hidden themes" of "humans bad, environment good". Maybe if he saw the movie before condemning it, he might have noticed that the secular bad guys persecute the religious good guys in the movie. Maybe that would have made him like the movie more. Or maybe not. After all, the alien inhabitants of a distant moon aren't portrayed as believers in Jesus Christ. The Vatican's film critics gave Avatar lukewarm reviews because of its positive depiction of nature worship. Apparently, a science fiction movie having any old religious theme is not good enough. It's better if the ten-foot tall blue aliens are Christians. The latest critics are the Chinese government. China is pulling Avatar from theaters earlier than expected, reportedly at the urging of propaganda officials who are concerned that Avatar is "drawing unwanted attention to the sensitive issue of forced evictions." Do you think the Tea Partiers might reconsider their opposition to Avatar if you pitch it as an epic fight against abuse of eminent domain? It's been said politics makes strange bedfellows. Avatar has to have something going for it to draw the Tea Party, the Vatican and Communist China together in criticism. Maybe that's why it's raked in $1.5 billion and counting. I might just have revise my own review in which I praised the movie's special effects but found its plot unoriginal and derivative.